Kenny says he was surprised by the red card decision. But 'we have to accept it'. Would rather talk about the spirit shown with ten men. Hard fought point at the end of the day. Was always going to be tough after going down to ten. Will bring you the reaction ASAP. F/T Wolves 0-0 Brighton: Ten-man Wolves share a point with Brighton at Molinuex after a game of few chances for either side. 90+5' Afobe's hauled down 20-yards from goal. Wolves have a free-kick. 90+4' Beram Kayal lines up a shot from 25-yards but it's well over the crossbar. 90+1' Sub for Wolves: Matt Doherty replaces James Henry. 90' Bruno Saltor is set on the edge of the Wolves box, his shot deflects off Edwards but Martinez punches behind for a corner. 88' Beram Kayal volleys on the edge of the Wolves box, it takes a deflection and misses wide. Martinez gets up and gathers the corner. 84' Golbourne crosses in the direction of Afobe but Brighton get up to head clear. The Wolves forward had been flagged offside. 82' Henry sets Afobe on the angle of the Brighton box but he doesn't catch the first time effort wide and misses wide. 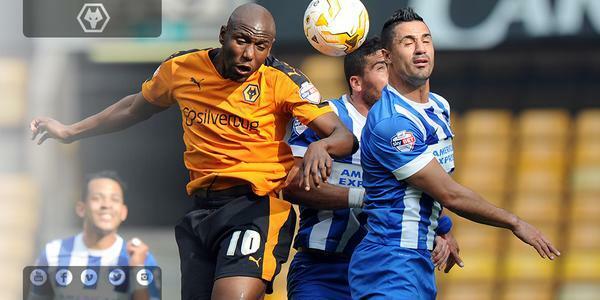 81' Free kick for Wolves on the left wing as Afobe's brought down by Bruno Saltor. Henry's cross glanced wide by Hause. 78' The ball breaks for Elvis Manu inside the Wolves box but Martinez is equal to his low effort. 77' Sub for Brighton: Kazenga Lua Lua is replaced by Bobby Zamora. 77' Kazenga Lua Lua's cross from the left wing is easily gathered by Martinez before the 'keeper delivers downfield. 75' Great defending tackle from McDonald preventing a low cross from Lua Lua. Follow-up ball headd into the arms of Martinez. 70' Commanding header from Hause to head clear, the ball is then lifted back into the Wolves box where Martinez gets up to claim. 69' Iorfa sees yellow for what the referee deemed as a trip on the left wing. Brighton free-kick. 68' Sub for Wolves: Nathan Byrne replaces Sheyi Ojo. 67' Kazenga Lua Lua's low cross into the Wolves box is smothered and held by Martinez with blue and white shirts in waiting. 66' Beram Keyal shoots from outside the box but it's low and straight into the hands of Martinez. Easy for the 'keeper. 64' Wolves counter Brighton and Henry's cross from the left wing is gathered by David Stockdale. Very tense game at the moment. 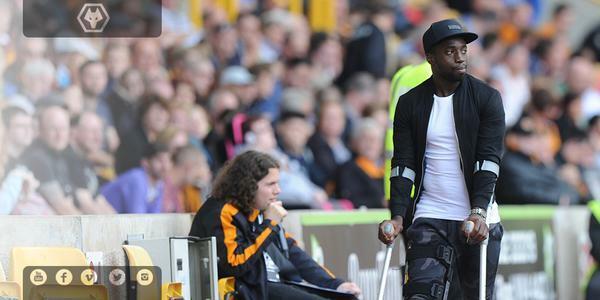 Break in play as Elvis Manu is down receiving treatment. 52' Sub for Wolves: Adam Le Fondre is replaced by Kevin McDonald. Red card. 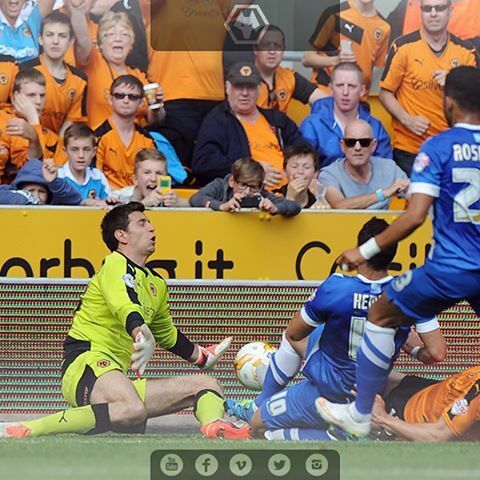 Conor Coady sees red for a strong challenge in the middle of the park. The sides are back out and we're back underway at Molineux. One change at the break for Brighton: Tomer Hemed replaced by Elvis Manu. 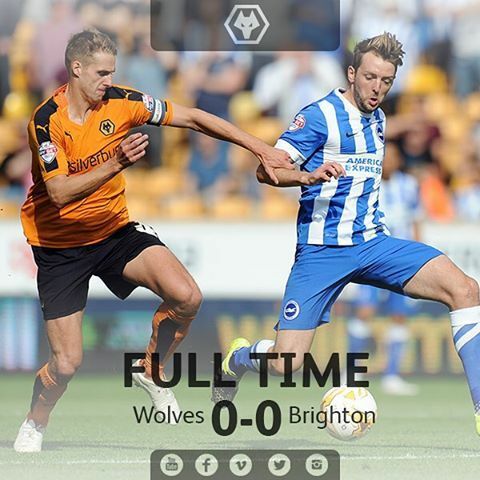 H/T Wolves 0-0 Brighton: Very balanced opening half at Molineux. Martinez penalty save keeps the scores level. 45+1' Henry's second corner causes chaos inside the Brighton box but Wolves just can't get a shot away and the away side clear their lines. 45' Henry lifts into the Brighton box and there's a mix-up between goalkeeper and defenders and the visitors clear for another corner. 44' Great work from Henry and Edwards sees the latter's low cross hooked away in the Brighton six-yard box. Wolves corner. 41' Le Fondre looks to exchange a quick one-two with Edwards but the ball deflects back to the feet of the midfielder whose shot is over. 39' Fantastic run from Iorfa out of the right back position, he makes it to the byline before crossing into the hands of David Stockdale. 38' Coady chips a through-ball in the direction of Afobe, David Stockdale just gets across to nick the ball off his toe. 35' Fantastic corner from Henry, whipped right into the six-yard box but nobody in a gold shirt can get there and the ball runs long.